We at The Temple believe firmly that learning is a lifelong endeavor. When we reach the end of our formal education as children, we've only begun to tap our full potential for knowledge and wisdom. That is why we strongly encourage all of our members to renew themselves and their community through out myriad adult learning opportunities.Together, we explore our Jewish values and heritage, immerse ourselves in the sacred texts, and deepen our connection to Judaism and to one another. 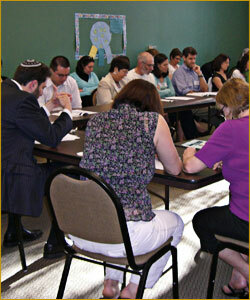 Our TAMID program offers an assortment of formal classes and programs that cover a range of topics and course lengths. Classes begin in the fall and run over two semesters into the spring. A complete handbook of courses is made available at the High Holy Days, and we encourage you to peruse our offerings and find those classes of interest to you. For those seeking more in depth Jewish study, The Temple hosts the Florence Melton School of Adult Jewish Learning, in partnership with the JCC/Lisa F Brill Institute of Jewish Learning. This certification program is a two-year program comprised of four classes: Purposes, Rhythms, Crossroads and Ethics. We also offer several Continuing Education courses for Melton Graduates. And for those adults who've never had a bar or bat mitzvah of their own, we have an annual program of study that leads up to our Adult B'nei Mitzvah service in the spring. This is a wonderful way to reaffirm your Jewish identity and immerse yourself in the study of Jewish liturgy and prayer.